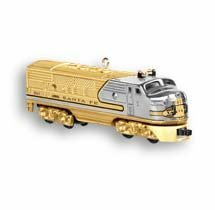 Hallmark 2006 Ornament ~~ LIONEL 1950 SANTA FE ~~ F3A DIESEL LOCOMOTIVE ~~ GOLD CROWN EXCLUSIVE ~~ REPAINT / COLORWAY ~~ LIMITED EDITION - SOLD OUT ~~ Repainted version of the 1997 Hallmark ornament. The Santa Fe, the best-selling engine in Lionel's history and an all-time Keepsake favorite. Die-cast metal. 4" W. Don't miss out! I have most current & older Hallmark ornaments, save on shipping with multiple items!!! Items Similar To "2006 Hallmark LIONEL Gold Locomotive REPAINT~COLORWAY "